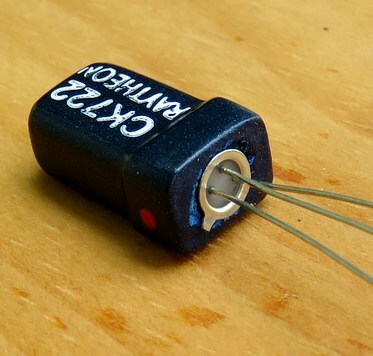 It's a real Germanium transistor, but not a CK722. I made it out of a piece of wood and ten coats of spray paint. Here's the wooden stick I used. 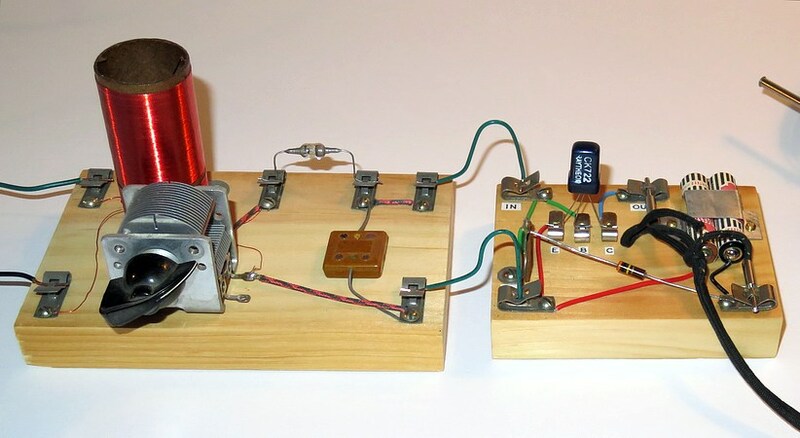 The original plan was to mold a CK722 transistor out of epoxy. I stuck the carved stick into a lump of home made clay, dropped in a transistor and filled it with J. B. Weld. When that didn't work I tried modeling clay and epoxy. After several failed attempts I gave up, cut the end of the stick off and drilled a hole in it. So what is this and what does it do? 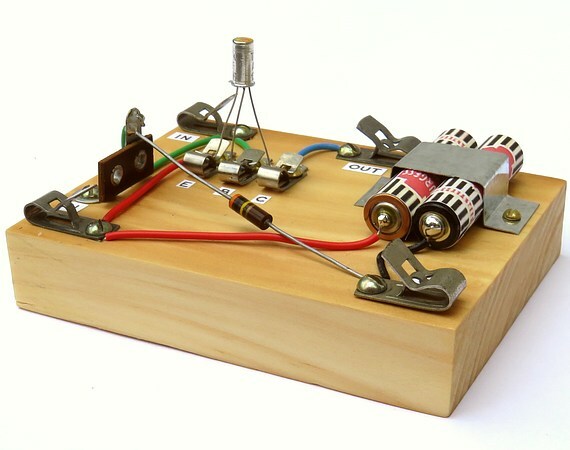 It's an audio amplifier for a crystal radio. It doesn't make the radio work any better but it makes it much louder, which does seem to give the illusion the radio works better. There is no on/off switch. Connecting the headphones completes the circuit. The volume is VERY loud on a strong station. 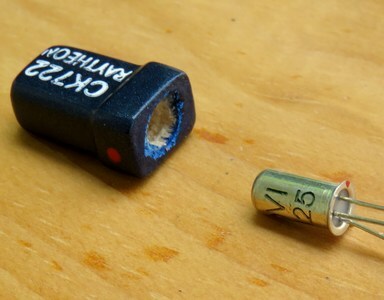 You probably need three volts with a real CK722 but I think a single dry cell would work fine with a modern transistor. As a matter of fact, I was listening to the radio while taking these pictures because I could hear the headphones on the table. A Raytheon CK722 was actually a repackaged CK718 that didn't meet specifications. They were also relatively expensive. Adjusted for inflation, a CK722 cost the equivalent of about $9.00 dollars in 1956. 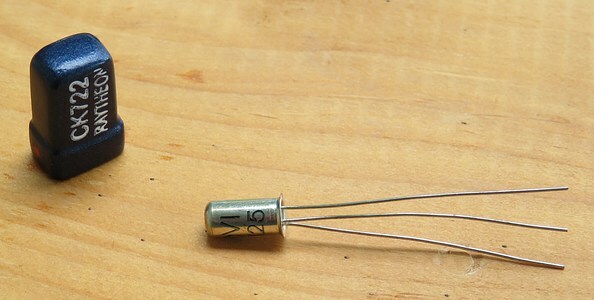 The transistor used in this version cost $0.29 in 2017. Actually, they were 10 for $2.90, imported from Germany via ebay. I thought that was appropriate since they are Germanium transistors. When I made a fake CK722 it wasn't much different than what Raytheon did, and it probably works a lot better. Morgan states in his book that over 10 million transistors were manufactured in 1956 and production was expected to be 30 million "in a few years." A typical, run-of-the-mill Quad core i7 microprocessor contains 731 million transistors. Add a Graphics Processor onto the CPU and the count is 1.6 BILLION. When you consider how many processors and chips are made today, it's plain that the semiconductor industry makes in a fraction of a second what once took a whole year to produce. Looking at it another way, using 1956 technology, it would take 73 years to make the transistors for ONE core i7 microprocessor. Here's the schematic. 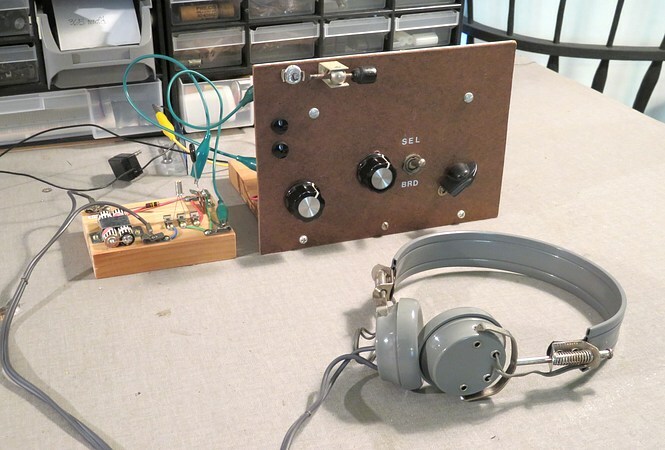 Morgan said to connect the amplifier to the radio through a capacitor, so the capacitor was built onboard the amplifier. It didn't work! The sound was very distorted, so it was removed. A Modern Radio Labs No. 2 crystal set, the Morgan amplifier and a pair of Superex "Sensiphone" Featherweight made-in-USA "quality" headphones. (That's what it says on the box.) I was able to remove the ground wire and still pick up stations with plenty of volume. 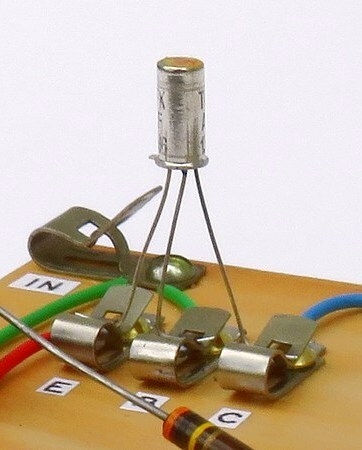 In this case, the coupling capacitor WAS needed. I guess Morgan didn't include it on the chassis because the need for it varies among different crystal radios. 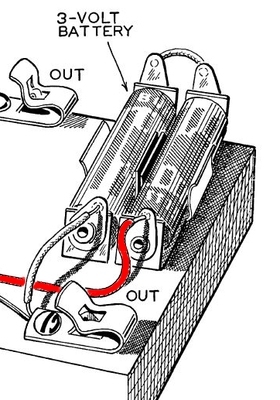 Morgan's radio books were written so you had to read them and think about what you are seeing, For instance, in one rendering the positive wire is on the left and in the other it is on the right. Which is correct? 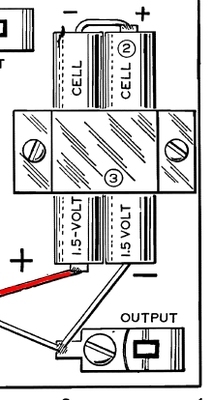 You have to look at the schematic; if you followed the negative wire you learned the schematic symbol for a battery and a resistor. 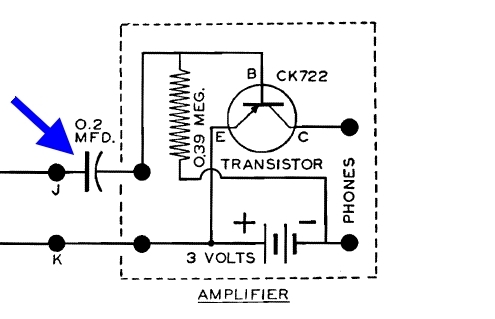 If you followed the positive wire you learned the schematic symbol for a transistor. 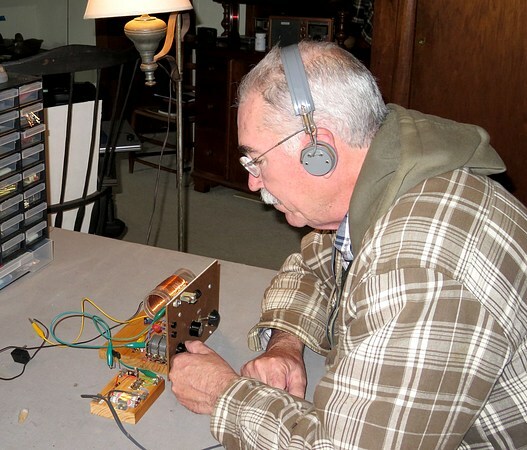 Yours Truly monitoring the airwaves on a crystal set, with the help of the Alfred P. Morgan transistor amplifier.